I ran the third and final session of the adventure Ice from the Eighth Doctor Sourcebook at the weekend. I think I could have finished this in two four-hour sessions, but we had more of a social thing going on and the focus wasn’t quite there. At a pinch, I think you could throttle this up to run in a single session or at a convention, but you would need to keep all the action tight. On top of that, you would need to be really sharp in hitting the beats associated with building the threat. The ultimate secret of the icebound alien colony doesn’t work so well unless you have done ground work on the back story. I think, despite having three sessions to run it over, I failed to do enough of that very ground work. Ah well – lessons learned. Overall, I enjoyed running the adventure – though I found myself increasingly improvising and casting the system to one side. I have to say that has everything to do with me and nothing to do with the Vortex system. When I want to get a game to a conclusion, the system goes out the window. Yes, the players still roll dice – because many of them enjoy that part of the process – but the nitty-gritty mechanics don’t trouble me. I liked the way the characters starting to do their own improvisation around the situation. When they realised that they didn’t have an easy escape route, they used some fast talking and deception to find an alternative. The adventure has a traditional aspect of putting the TARDIS off-limits early on, so Tegan and Nyssa found a way to get it back – and then I threw the big threat in their way. Panic ensued, followed by the sonorous tones of the Cloister Bell. Yes, you have the TARDIS back; no, it won’t budge because the time rotor is making all the wrong sounds. I enjoyed running the game and all the players go involved for the final session (after some patchy player participation in earlier sessions). The final showdown had just the right level of cricket involved (it was the Fifth Doctor!) and a final-final scene with a touch of Flash Gordon about it. Did the villian die or did he simply slip away to return another day? This entry was posted in Roleplaying, The Classic Doctors and tagged Adventures in Time and Space, Doctor Who, Fifth Doctor, TARDIS on August 12, 2015 by Paul B.
I recently played the first session of the Ice adventure from the Eighth Doctor Sourcebook. I’m not running this as a campaign, per the intentions of the supplement, but as a standalone. I felt that the adventure would work quite nicely that way. I also used the Fifth Doctor and Nyssa as the characters at the centre of the adventure. The adventure slots into the continuity between Time-Flight and Arc of Infinity in the series (between Season 19 and 20), where several New Adventure novels and Big Finish audio dramas probably all dwell. As it happens, this choice came down to the players. One loved the Nyssa character and wanted to play her, so it seemed to be just right. 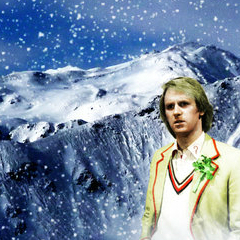 Ice involves rooting around in caves beneath a frozen planet and somehow that seemed perfectly Fifth Doctor as well. All this isn’t really the point of this post. What I wanted to mention was the fact that I punctuated the session with music. At the start of the adventure the TARDIS arrivals unexpectedly on a cold planet. Unexpectedly arrivals are not unusual in Who. In this case, the cold is the unusual part. The TARDIS feels cold. So, the Doctor’s curiosity gets the better of him, as how could a planet penetrate the TARDIS like that? After finding suitable clothes in the Wardrobe, the two character ventured out and I described the desolate, glacial scenery. And the cold. They trudged a bit and casting around they realised that something lay beneath the ice, some relic of an alien city. At that point, a snowmobile appeared in the distance. Nyssa hid while The Doctor bid a cheery hello to the newcomer. While conversation ensued, Nyssa became aware of an odd vibration in the ice. Or was it more of a tremor? A moment later, mid-conversation, the guy on the snowmobile wheeled it around as the ice creaked, shuddered and then cracked. Sheets of grey-blue ice jabbed skyward while others dropped into the abyss. Both characters made a leap for safety, The Doctor fell, only for his fingers to catch an edge. And then it dropped out of sight. Queue the stab of the Who theme. POW. If they hadn’t got in the mood up to that point, the theme made all the difference. We’re all suddenly bobbing about and squeal wee-woo. It set the mood and also served as a way to cut to the next scene, as the snowmobile ground into the waiting camp beyond the mountains. No need to worry about the journey between or the uneasy silence from the stranger. The Doctor and Nyssa could worry about the TARDIS later – they had new people to meet and a mysterious city to uncover. The theme worked really well. I can’t say that music works for everyone, and as a background noise it will be Marmite for some groups. But in that moment, the stab of the Theme worked wonderfully well, just as the outro version of the theme worked well at the end of the session, just as I revealed the cliffhanger revelation. I recommend giving it a try, whatever the game. If you can find a theme tune, go for it. I can see it providing a valuable and rather entertaining framing motif. If you follow the TV serial approach to games, it doesn’t always have to happen at the same time. Some shows you can go five, ten, even fifteen minutes before they kick in the theme tune and the opening credits. In a longer drama or serial, they have a degree of leeway – as do you in running a gaming session. Find a tune. Set the tone of the session. Hit the danger or reveal the cliffhanger from last session – and then play the theme. This entry was posted in Roleplaying, The Classic Doctors and tagged Adventures in Time and Space, Doctor Who, Fifth Doctor, TARDIS on June 8, 2015 by Paul B.